Supermarket, post-office, restaurants, cafes and all kind of shops you find right next door. Historical monuments, churches, cathedrals, City Hall, shopping streets like 'Santa Catarina' and 'Cedofeita', Ribeira with its famous 'dubble bridge' and countless restaurants and bars, the wine cellars, ...Nightlife!..., it is all within walking distance. In case you need... metro station, bus stops and taxi rank are nearby. The hostel itself is provided with 3 mixed dorms (8+8+6 pax), 1 female dorm (4 pax) and 1 private room with 1 double + 1 single bed. All equipped with individual lockers and reading lamps. Separated female and male bathrooms. 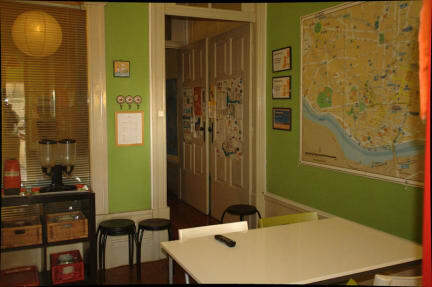 Computer room with free internet. WiFi available. Free use of fully equipped kitchen, dining room and outdoor terrace with barbecue. Furthermore a comfortable living room for relaxation, watching tv or a film on DVD, listening to the music, or having some fun with karaoke, reading a book or having conservation with the other guests. By the way, breakfast is free! We hope seeing you soon. With the help from our staff we'll try to make you feel yourself at home. Excelente estadia! el staff super amable y servicial, me senti como en casa. Las instaciones estan siempre limpias, la ubicacion es perfecta, el barrio es tranquilo pero a la vez cerca de las discotecas y centros turisticos, los voy a extrañar, abraços! A minha estadia foi muito agradável, fui muito bem recebida pelo staff e a nível de limpeza estava tudo impecável. Excelente! I Will surely return. I really enjoyed my stay. Very friendly staff. Gostei muito, staff muito simpático e o hostel é muito acolhedor. Voltarei!! Friendly staff. Clean and safe, lockers in the bedrooms. Front door always closed to get in you need to ring the bell. Very good atmosphere! I met some nice people here :) definitely recommend it! 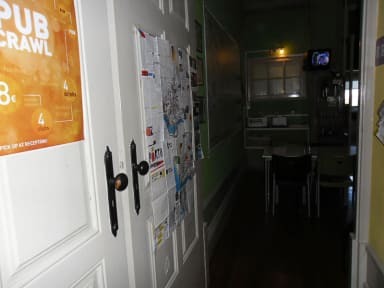 Eu gostei muito deste hostel. A dona e muita amigavel e tenta de ajudar aos hospedes. Ela pegou um mapa e me mostrou todos os sitios turisticos em Porto que eu devia visitar. Alem disso, eu gostei muito da localizacao do albergue. Eu sei que muitas pessoas avaliaram que o hostel fica longe demais do centro mais isso nao e verdade. Pode-se ir caminhando e em 10 minutos voce esta na Praca da Liberdade e ela se entontra no centro mesmo. Tambem tem lugares perto do hostel para comer MUITO baratos. This is a very simple Hostel. Perfect for a one night stay as it was my case when something unespected happened and had to find a place to stay. Cheap and not far from centre and transports. Very helpful staff. Situated in a very old quarter, Lapa. Had some difficulty to find the entrance at evening light. Basic conditions but enough. Breakfast included and towels to rent.